Mol. Cells. Jan 31, 2016; 39(1): 31-39. Reactive oxygen species (ROS), which include the superoxide anion (O2·−), hydrogen peroxide (H2O2) and the hydroxyl radical (HO·), are produced by the incomplete reduction of oxygen. It is in the fifties that ROS were first proposed to mediate the toxicity of elevated oxygen tension, i.e. poor growth, inflammation, genome instability, loss of cell fitness and cell death, because of their chemical reactivity that is much greater than that of oxygen (Imlay, 2013). 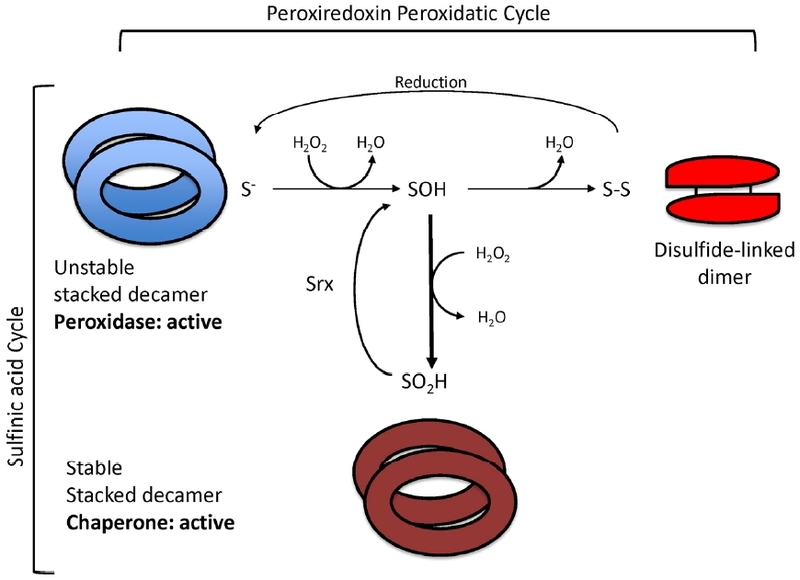 The discovery of superoxide dismutase (SOD) by McCord and Fridovich, the enzyme that scavenges O2·− (McCord and Fridovich, 1969), in addition to the long known catalases and peroxidases, the enzymes that degrade H2O2, strongly supported this hypothesis, as indicating that H2O2 and O2·− are not only present in living organism, but must be also harmful because enzymes exist to destroy them. However, definite proofs that ROS are the perpetrators of oxygen toxicity came in the eighties with the advent of genetic studies in microorganisms, which showed that disabling ROS scavengers indeed exacerbates the phenotypes of hyperbaric oxygen, thus linking oxygen toxicity to the ROS scavenged by a particular enzyme (Carlioz and Touati, 1986). The peroxiredoxins constitute a very large and highly conserved family of thiol-based peroxidases that has been discovered only very recently, in the nineties. They are bona fide antioxidants that are attracting tremendous attention due to their extra functions in ROS signaling and protein quality control, and to their association with cancer, aging, inflammation and vascular diseases. The Prx1 subgroup of peroxiredoxins, also known as typical 2-Cys Prxs, is the most widespread of the six Prx subfamilies, from archaea, bacteria to eukaryotes (Nelson et al., 2011; Soito et al., 2011). Eukaryotic 2-Cys Prxs share with their prokaryotic counterpart fast catalytic rates (kcat/Km 107–108 M−1 s−1 ∼ 107 M−1 s−1) (Parsonage et al., 2008; Peskin et al., 2007), and an extraordinary high reactivity towards peroxides, but are distinguished from them by undergoing inactivation by hyperoxidation at elevated H2O2 levels (Woo et al., 2003; Wood et al., 2003; Yang et al., 2002). This peculiar attribute individualizes two alternative catalytic cycles, the peroxidatic one and the sulfinic acid one, displayed in Fig. 1. 2-Cys Prxs enzymatic cycling involves dramatic changes in quaternary structure (Noichri et al., 2015). See the text. 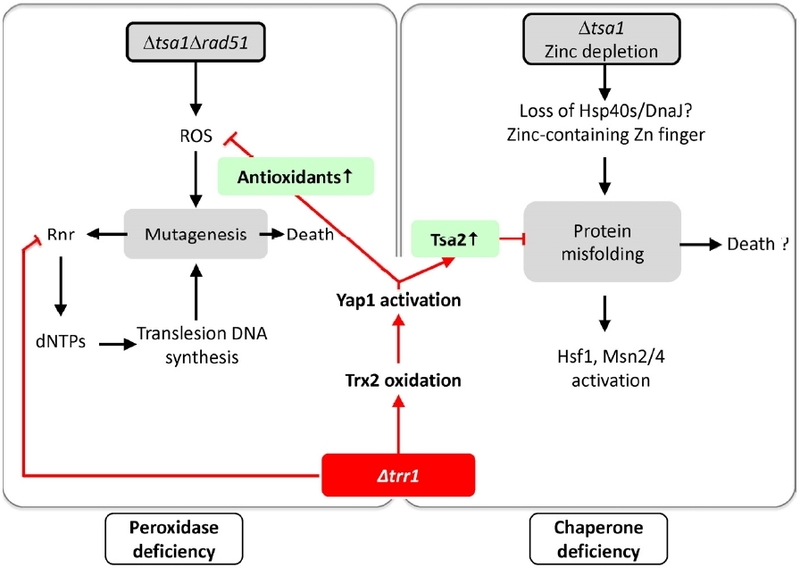 If indeed H2O2 requires Orp1, Tsa1 or Tpx1 for regulating adaptive oxidative stress responses, would other cellular H2O2 responses make similar use of specific receptors? This question was addressed by monitoring the genome-wide response to H2O2 in the Δ8 strain that lacks all eight thiol-based peroxidases (see above) (Fomenko et al., 2011). The massive genomic response to H2O2 —about 1000 genes induced and 500 others repressed, was totally abated in Δ8, irrespective of the concentration of the oxidant and duration of exposure. 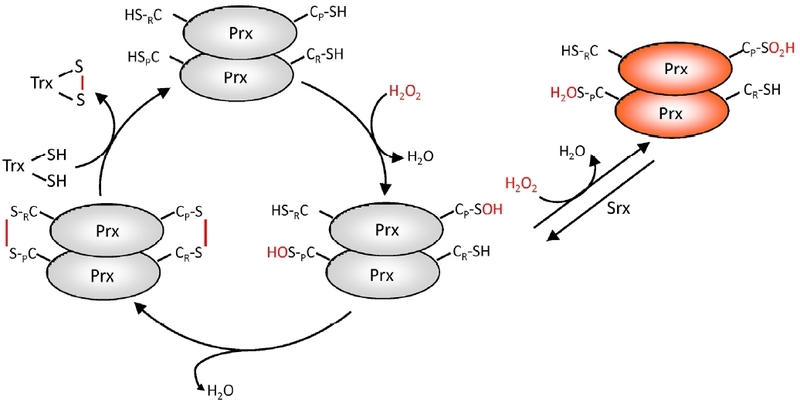 Hence, at least in S. cerevisiae, H2O2 never directly reaches its regulatory targets but is instead funneled to them by ways of thiol peroxidase relays. These data further establish the role of thiol peroxidases as receptors/sensors in H2O2 signaling, which is now also emerging in higher eukaryotes (Sobotta et al., 2015). Mol. Cells.Jan 31, 2016; 39(1): 31-39. Received November 30, 2015; Accepted December 2, 2015. The two catalytic cycles of 2-Cys Prxs ( Noichri et al., 2015). 2-Cys Prx are obligate head-to-tail B-type homodimers, each with two catalytic Cys residues. 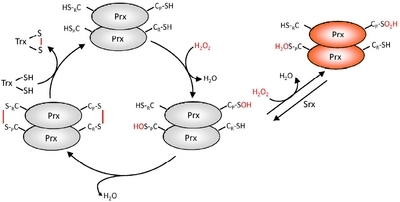 In the peroxidatic cycle, the N-terminal Cys, named CP for peroxidatic Cys, reduces H2O2 by direct reaction with release of one H2O molecule, and is in turn oxidized to a sulfenic acid (CP-SOH) ( Wood et al., 2003). The Cys-sulfenic acid moiety then condenses with the C-terminal catalytic Cys residue of the other subunit, or resolving Cys (CR) into an intermolecular disulfide, with release of the second H2O molecule. Disulfide formation causes an important structural remodeling both at the CP-active site pocket and CR-containing C-terminal domain, which switches the enzyme structure form a fully folded (FF) to a locally unfolded (LU) conformation ( Hall et al., 2011; Wood et al., 2003). Karplus and coworkers have elegantly shown that the enzyme FF conformation both stabilizes the deprotonated reactive form of CP and provides a steric and electrostatic environment that activates H2O2, hence establishing the observed CP extraordinary high reactivity for H2O2 ( Hall et al., 2010; Karplus, 2015). The catalytic intermolecular disulfide is subsequently reduced by thioredoxin, which completes the catalytic cycle, returning the enzyme to the FF conformation. In the sulfinic acid cycle however, the CP-SOH further reacts with H2O2 instead of condensing with CR, thus becoming oxidized to the corresponding sulfinic acid (−SO2H), which exit the enzyme from the peroxidatic cycle. Sulfinylated Prx undergoes a slow ATP-dependent reduction by the enzyme sulfiredoxin (Srx), which returns the enzyme into the peroxidatic cycle ( Biteau et al., 2003; Woo et al., 2003). Sensitivity of eukaryotic enzymes to hyperoxidation is linked to the presence of two sequence fingerprints absent in other family enzymes, an insertion in the loop between α4 and β5 carrying the conserved GGLG motif, and an additional helix (α7) occurring as a C-terminal extension and containing the conserved YF motif ( Wood et al., 2003). Such a structural configuration is thought to slow down the FF to LU transition rate, thereby favoring hyperoxidation. 2-Cys Prxs enzymatic cycling involves dramatic changes in quaternary structure ( Noichri et al., 2015). See the text. 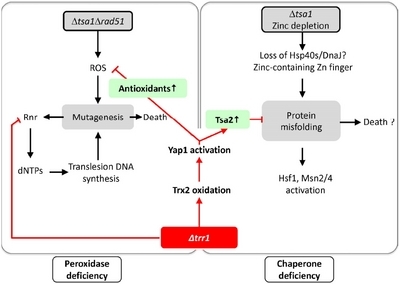 Loss-of function mutations of cytosolic thioredoxin reductase-encoding TRR1 suppress defects in H2O2 scavenging and protein quality control linked to the loss of TSA1 ( MacDiarmid et al., 2013; Ragu et al., 2014). Suppression is indicated in red arrows (see text).